Renting a villa in Italy, France or Spain isn’t just for millionaires. Perhaps surprisingly, villa rental can be more reasonable than staying in a hotel, especially if you’re a family a larger group (though being a millionaire does help if you want to rent an entire Tuscan village from the Ferragamo family). 1) Decide if a villa vacation is for you. The pros are that you’ll have a base for a week or two that you can come back to each night. You can stay in all day, lounge by the pool or in the garden, take in the culture somewhere else, eat in or out… all up to you. The cons are that there’s no daily maid service or other hotel amenities, you are in the same place (so visiting places far from base means a longer round trip), and you have to keep the place reasonably clean and tidy. You’ll likely be doing cooking yourself if you stay in, though you can also hire a cook — and in some places you can also hire a maid if you want more frequent cleaning. Personally, I am happy to trade hotel amenities for a more relaxed and flexible vacation. 2) Pick a country and general geography — South of France, Tuscany etc — based on the kind of things you want to do and see. Get a few guidebooks to places you think you might like to go. My personal favorites are the Dorling Kindersley “Eyewitness” travel guides (DK guides), and the Rough Guides. I like the DK guides because they’re chock full of photographs so you can get a better idea of what a place is really like, and they’re also a good starting point for planning photography trips. The Rough Guides are impeccably researched with good writing on places, history, art and contemporary life, with great vignettes on the famous locals. However, although brimming with great maps to get you around, they are sparsely illustrated when it comes to photos. 3) Decide whereabouts you want to be in relation to the places and things you want to see and do. For example, if you really want to spend your days soaking up the world's greatest collection of renaissance art in Florence, don't base yourself in a cute-but-remote villa in the rolling hills of Chianti 20 minutes drive from the nearest major road. Mightily obvious, perhaps, but consider this: we were enjoying a dinner of incredibly fresh pasta with a great Brunello di Montalcino wine in a small enoteca (wine bar) walking distance from our Tuscan villa. The owner was friendly and keen to share his knowledge of the local wines and the chef smiled shyly from her kitchen. Two women walked in and headed straight to the bar and asked for Martinis, which the owner couldn't make because he only has a license to sell wine. They were fed up having found no decent shopping all day. Their base was in the middle of rural, hilly Chianti, at least an hour from the nearest Prada store. They had yet to find a bar that could make a Martini and would have been far happier in at hotel or apartment in central Florence or Rome. 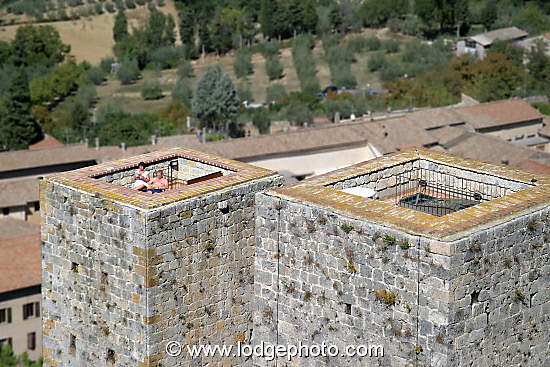 The top of your private medieval tower provides the perfect platform for sun-bathing. San Gimignano, Tuscany, Italy. 4) Put together a group that can get on well with each other. Villas work better financially when you can spread the cost out across more people, and farm and country house conversions abound in Tuscany and France. This means there are plenty of villas for rent that can sleep 8, 10, 12 or more. However, you should consider carefully who will vacation with you: do you really want to spend a week or two with them in the same house? It's tempting to add friends-of-friends to make up the numbers and keep costs down, but consider how well you know these people and whether you'll get on. A tense atmosphere is the last thing you need on your vacation. 5) You know where you want to be and what is important to you and your fellow guests, and what size of place you need. So how to find a suitable villa? Our first villa rental was though ItalianVillas.com, subsequently purchased by the AAA and now part of AAA Travel. They were a great choice primarily because they really knew their stuff: they had been to all the properties shown on their site, and you could call them and talk to someone who can tell you if a property is right for you. A good agency will share advice on the vagaries of Italian homes that are sometimes surprising. For example, you can't turn on the heating in September just because it is cold -- you must wait until after a certain date in October when the Italian government has decided it's OK to turn on your heating (!) So put on a sweater and see if you can find wood for a fire instead. The point is to find an agency that knows its product. Avoid agencies that do not or are just "aggregating" traffic. They are not interested in whether you have a good experience -- they're after the commission (as much as 50%) and on to the next deal. The only remaining thing to check is the villa location, as sites are often vague when it comes to the specific location ("10 minutes from Siena" doesn't cut it). You need to know this so you won't be stuck miles from all the things you want to see and do. In the age of GPS and Google Maps there's no excuse anymore for vague locations. Plug the name into Google Maps and see where it is relative to roads, railways etc. Through the magic of satellite imagery, you can also avoid unpleasant surprises, such as renting a pretty villa right next to a large-scale "industrial" farm (this happened to us once, though we didn't let it ruin our trip). Renting directly is a substantial cost saving to going through an agency -- 40-50% less -- but you need to know what to look for and what to expect. This is the value that a good agency can bring and why they're a great idea if you're new to villa rental or a particular area. After we had rented twice with ItalianVillas.com in Tuscany, we knew enough about what to expect to rent directly from villa owners. 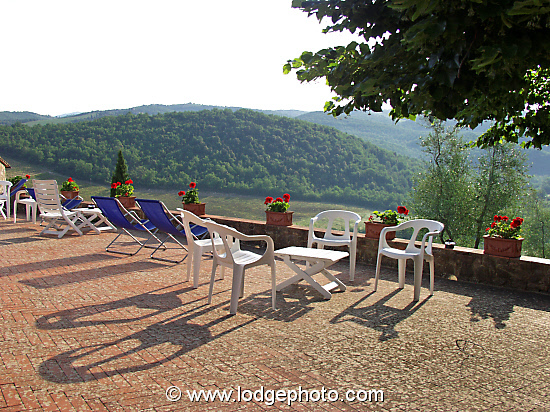 We found new places to stay a stone's throw from a villa -- like Vignamaggio, the place in the photo below. You might also consider hiring a cook. For some, this conjures images of impossibly expensive executive chefs, but in fact it can cost the same or less as an evening at a good restaurant. A few years ago we rented with friends in Tuscany and wanted a cook to come 2-3 times a week to make dinner for all 12 of us. We have rented several times from the owners, a retired Italian executive couple, and they knew a cook who grew up in a family that owned a restaurant. She was phenomenally good, turning out four course meals of traditional, simple Tuscan cuisine with whatever was freshest and best, all for about 30 Euros a head. She cooked on the first night when everyone was tired and cranky from a day spent crammed on planes and in security lines, which helped everyone to relax and start to enjoy the vacation. We either cooked for ourselves or ate out on the other nights, and having her come by every few days was a great way to bring everyone together throughout the trip. So when you're planning this year's vacation and have re-started your heart after peeking at the Dollar/Euro exchange rate, consider villa rental. With a little planning, it can give you relaxing, fulfilling vacations that you'll remember for a lifetime. Flag throwers from the Eagle contrade of Siena cast shadows on the Piazza Del Campo during afternoon practice. Chianti, Tuscany, Italy.